Wichelstowe is a new suburb, on the southern edge of the growing town of Swindon. When complete, Wichelstowe will comprise of three distinct but joined communities. Development in East Wichel started in 2008 and is now almost complete. Work is now underway at Canalside which will include the District Centre and the first houses in the central area of the site. The third area, West Wichel will then be developed, with a total of around 4000 new houses in Wichelstowe as a whole. Construction on the Deanery Church of England Academy is nearing completion! The school will open in September 2019, welcoming year 7 pupils from across Swindon. Student numbers will gradually increase each year as a new year 7 group is added. When the school is fully open there will be around 1400 students including approximately 400 sixth form students. The school will be run by the Diocese of Bristol Academies Trust and will include a Sport England standard multi-use games area as well as an all-weather pitch designed to Sport England hockey standards. An impressive theatre space also provides enhanced performing arts facilities. In February 2019 a time capsule was buried at the front of the school containing the Church of England’s vision for education, a cross from the Holy Land, a school tie and brochure, and the front page of the Swindon Advertiser. Attendees included the Bishop of Swindon and reps from the DfE, the DBAT Board of Directors and Wroughton and Wichelstowe parish church. We have been working with The Deanery School in Wichelstowe to understand how we might be involved in the community coffee shop that’s being opened in the new school building. We have now agreed with the school that the business side of the coffee shop will be run by the school’s catering supplier, leaving the church free to focus on using the coffee shop as a base for community outreach. This is an important step forwards and means that we now have the freedom to invest all of our energy in connecting directly with the new community in Wichelstowe. Please pray for this venture and do let Revd Phill or the Churchwardens know if you want to get involved! A detailed planning application for 85 new homes in the Canalside area of Wichelstowe has been submitted by architects on behalf of Swindon Borough Council. 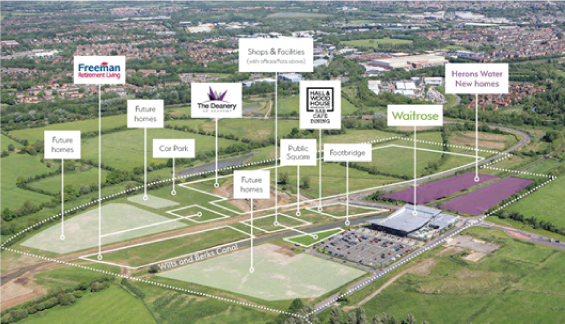 The choice of 1, 2, 3 and 4 bed homes for sale will be located to the north of the existing Waitrose store and be situated along both banks of the canal. Construction is expected to start this year.